Francesco Balsamo, who presided over the completion of Palermo’s cathedral, died in 1871. But he stands today in the Capuchin cemetery of that city, in his priestly robes and cardinal’s hat – his mouth agape in a soundless scream. With him are 8.000 of his fellow citizens, decked in their 19th-century Sunday best. There are prelates and lawyers and virgins and babies, a microcosm of Sicilian society, each in his appointed place. Segregated galleries dimly lit by air-vents, group monks, notables, women and children. The men are slung upright on wire supports along the walls, heads lolling; the virgins wear garlands of roses and bear palm fronds; the matrons are bedded down in niches on dusty pillows. 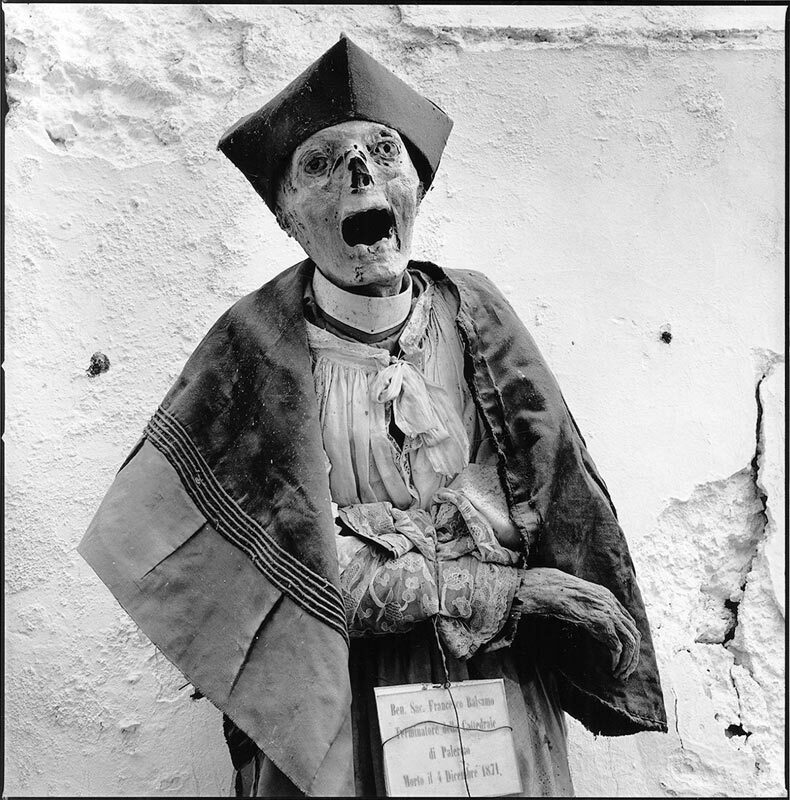 The catacombs are a tourist attraction (…) but there was no real record of them until Jesse Fernandez decided to capture them on black-and-white film last year. 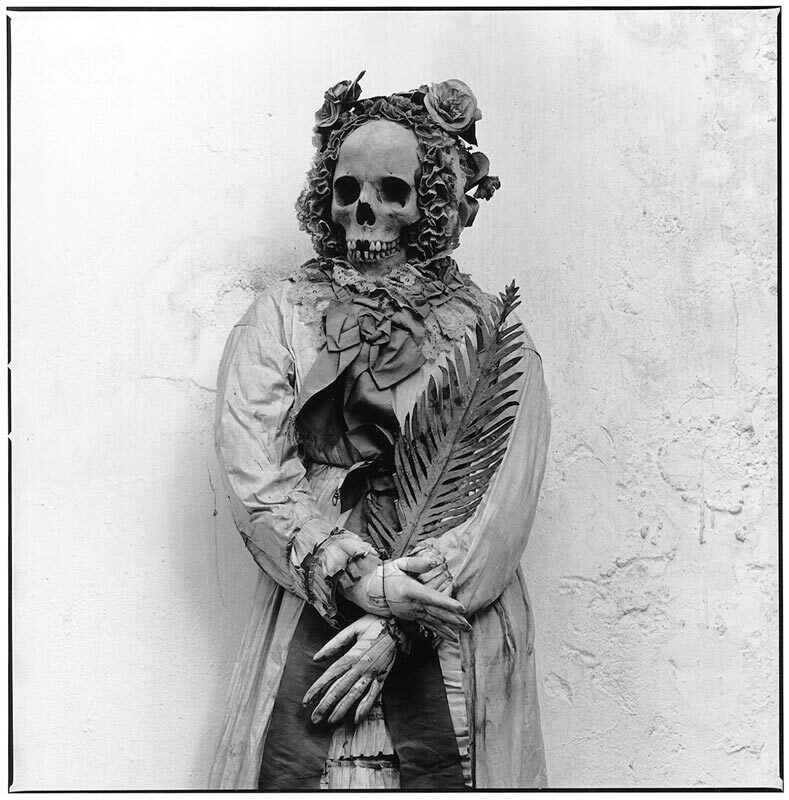 “Where else can you photograph someone dressed up as in the time of Nadar?” asks the Cuban-born photographer, who likes to point out that most of the mummies were left in place in the mid-19th century, in the early years of photography. As an ex-Time-Life staffer with an eye for a good “picture story” (…), Fernandez seized on the catacombs as self-contained, visual subject – “a complete subterranean world”, as he puts it. 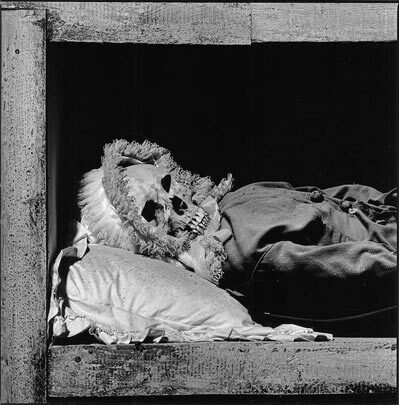 The result is a series of stark but sensitive pictures, taken entirely by natural light and published as “Les Momies de Palerme” by Editions Chêne in Paris, with an introduction by Dominique Fernandez (no relation), the French writer known for his work on Italy. The photographer’s eye is matter-of-fact, dispassionate; Ripley’s Believe it or Not would be disappointed. “I didn’t try to make art out of it”, Fernandez explains simply. “I didn’t want to monkey around with lights and things.” He transforms the blood-curdling into an exercise in style; unaffected enthusiasm for his subject dissolves the macabre like an acid bath. The mummies speak for themselves, but Fernandez does not play down visual parallels. In one of the rooms closed off to visitors sits a panel of prelates that looks like an Inquisition tribunal. One emaciated, angular figure is straight out of Egon Schiele; the round maws of others are, as Fernandez puts it, “more Bacon than [Francis] Bacon.” One is not surprised to hear that Fernandez is a painter – and that his drawings are peopled with death heads. Charnel houses and ossuaries come two a penny; the Capuchins loved to make patterns with shinbones, as any visitor to their crypt off the via Veneto in Rome will discover. But since the Egyptians, few societies have preserved their dead on a grand scale, with the exception of the pre-Colombians in Peru and Mexico. (…) The systematic mummification of a community – or at least the members of its ruling class – makes the Capuchin cemetery a unique phenomenon in the 19th century, according to Fernandez. The cemetery was opened in 1599, when the monks discovered that their monastery’s soil had preservative qualities. The process of conservation, called colatoio, was costly, if makeshift. The Capuchins would remove entrails, wall up the corpses for three months in a chamber dug into the soil, wash them in a bath of vinegar and aromatic herbs and dry them in the sun. A year later the doting relatives would dress up the dead and put them in their place of honor, returning to pay respectful visits and to wire up the odd wayward limb. Places were much sought after, and if a family failed to pay the annual dues for the ancestors, the bodies were unceremoniously cast out. An edict of 1880 closed the cemetery and put an end to its 19th-century vogue. Two additional entrants, however, found their way in. One was Palermo’s American consul, complete with sweeping moustaches; the other, 2-year-old Rosalia Lombardo, is now the focus for a cult following. (…) Fernandez finds this imitation of life the cemetery’s only truly horrifying sight. Two earthquakes, two U.S. bombs and a fire 10 years ago have come to trouble the catacombs, and the Capuchin monk who guards them says that the mummies are deteriorating fast. The skin peels off and falls to dust, and underneath the virgin’s rosy bonnets and the bishops’ miters are only grinning death heads. Visiting Palermitani are unmoved by it all, mixing with their ancestors with great familiarity.